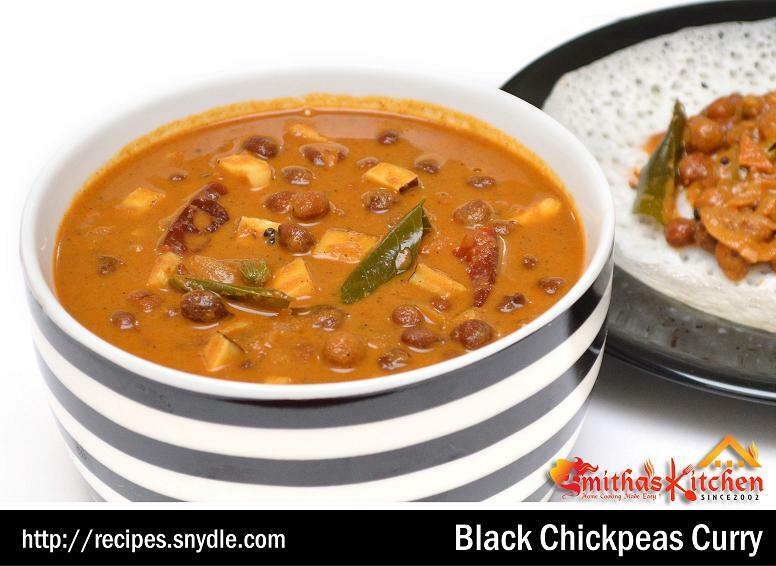 BLACK CHICKPEAS CURRY (കടലക്കറി) is a regular breakfast side dish goes well with many items like Puttu, Appam, idly, Dosa etc. in most of the South Indian homes especially in Kerala. It’s one of the traditional dishes of Kerala cuisine. Coconut Oil – 2 to 3 tbsp. Soak the chickpeas overnight and pressure cook for 2 or 3 whistles or until become soft and keep aside. Dry roast the grated coconut until light golden brown. Add red chilli, powder, coriander powder and continue roasting for few more seconds and remove from the heat. When the above roasted coconut mix reaches to the room temperature, grind them together to a fine paste adding little water and keep aside. Heat oil in a pan and splutter mustard seeds. Add dry red chilli, curry leaves, chopped shallots, coconut pieces, green chilli and saute well for few seconds. Add onion, little salt and saute well until become golden brown. Add tomato and cook until it mashes well. Add salt, garam masala powder, boiled chickpeas along with its water, ground coconut mixture paste and combine well. Cook for few minutes on medium high flame until the gravy reaches to the right consistency. We can mash few chickpeas with a ladle for making the gravy thicker. Switch off the flame and serve hot with Puttu, Appam, Idiyappam, Idly Dosa etc.